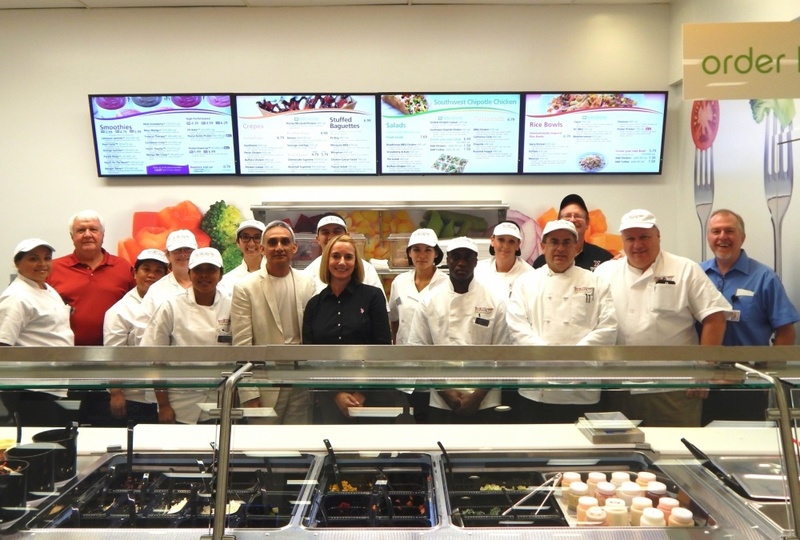 The Army & Air Force Exchange Service ushered in a new era of healthy dining options as Freshens Fresh Food Studio made its debut at the Davis-Monthan Air Force Base Exchange food court, marking the restaurant’s first direct-operated location on an Army or Air Force installation. 355th Mission Support Group Commander Col. Laurie Richter, Freshens President and CEO John Stern, Senior Vice President Ed Redmond, Exchange Western Regional Vice President Stephanie Burns and Exchange Director of Food Programs Darrin McCready joined Chetri in cutting the ribbon on the new restaurant, officially welcoming Freshens to the Exchange family during a grand-opening celebration July 18. Freshens is known for health-conscious offerings such as hand-crafted crepes, salads, rice bowls, artisan flatbreads, smoothies and yogurt. Freshens also supports the environment by using Ecotainers, which are compostable and biodegradable. The restaurant meets the highest rated nutritional qualification of the military’s new Performance Triad. “The Exchange is excited to be able to offer a brand that’s uniquely positioned to meet the needs of service members,” said Nalan Howard, Exchange restaurant program planner for Freshens.